Action from AFC Stanground Sports v Moulton Harrox (blue). Photo: David Lowndes. New manager Julian Spalding has rejuvenated Sawtry FC. Spalding, who ran the club’s reserve team in Peterborough League Division Three, has overseen three wins in his first three Premier Division, the latest an eye-opening 10-1 success at Langoft United on Saturday (August 12). Moulton Harrox face the camera before a 1-0 Peterborough Premier Division win at AFC Stanground Sports, back row from left, Nigel Steadman, Louis Steadman, Phil Groves, Jake Cawthorne, Wayne Wilding, Ashley Coddington, Jake Mason, Matthew Watkin, front, Josh McGuire, Ian Bradbury, Bobby Patterson, Robbie Relf, Dan Woods, Marcus Parry, Paul Crowson. Nathan Smith scored four goals with Lee Deane (2), Matthew Warman, Ashley Yeomans, Talenda Chipunza and Lewis Waldron completing the rout. Sawtry, who have a tough game at home to Netherton United tomorrow (August 15) are second in the early table, three points behind perennial title challengers Moulton Harrox who have collected four wins already. 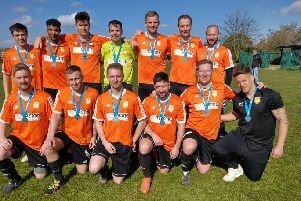 They were pushed hard by AFC Stanground Sports at the weekend with Matthew Watkin scoring the only goal of the fame in the second-half. Leverington, who travel to Moulton Harrox tomorrow, are third despite dropping their first points of the season in a 2-2 draw with Ketton and there was a second defeat in three matches for ICA Sports, a team some expected to push hard for top spot. The city side were duffed up 4-1 at Stamford Lions for whom Tom Lees scored twice. Deeping Rangers Reserves have enjoyed a decent start. It’s six points from three games after a 2-1 win over Holbeach United Reserves with Talal Karama and Elliott Ramsden scoring the goals. AFC Stanground Sports 0, Moulton Harrox 1 (Watkin); Deeping Rangers Res 2 (Karama, Ramsden), Holbeach United Res 1; Langtoft United 1, Sawtry 10 (N. Smith 4, Deane 2, Warman, Yeomans, Chipunza, Waldron); Leverington Sports 2 (Raychev. og), Ketton 2 (Bass, Hood); Stamford Lions 4 (Lees 2, Ford, Collins), ICA Sports 1 (Spearink); Sutton Bridge United 1 (Sutton), Thorney 0. Ketton v Langtoft United, Moulton Harrox v Leverington, Sawtry v Netherton United, Peterborough Sports Reserves v Wisbech Town. AFC Stanground Sports v ICA Sports, Deeping Rangers Reserves v Stamford Lions.